Million Dollar View without Million Dollar Price! 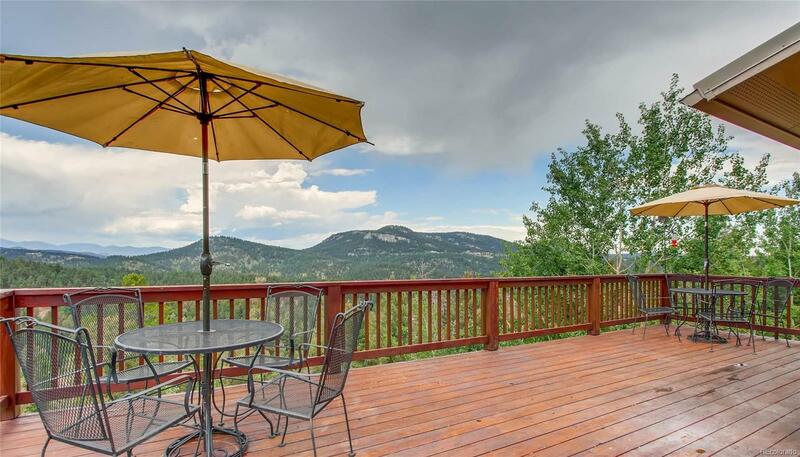 Unobstructed panoramic view will take your breath away! Secluded on 5 acres, this 2,545 square foot, 4 bedroom, 3 bathroom ranch with open floor plan has been newly renovated/updated. Sitting on the wrap-around large deck and enjoying this private and peaceful natural beauty feels like a piece of heaven. New interior paint, new carpet, new stainless gas range with grill, microwave, dishwasher, farm sink, newly renovated bathrooms with mosaic tiles, chic barn door, jetted tub in master bath, new doors, porch lights etc. Southern exposure, 2 fireplaces, natural gas, electricity. The desirable Conifer Meadows is only about 36 miles to Denver, easy access off Hwy 285, 5 miles to Conifer Town Center with modern world conveniences of Natural Grocers, Safeway, coffee, doctors' offices, banks. Close to Pike National Forest for camping, hiking, mountain biking. Red Rocks Park and Amphitheater is in the area. Come/see yourself!